The Palm Beach Nanny Agency has proven that personal service and customer care should always be first priority when providing the perfect childcare service for your family. Nanny Poppinz of Palm Beach FL cares about you and your children above all. We are committed to perfecting our service. We provide the most qualified Nannies in the area. As well as the traditional full time Nanny we have date night Nannies, Infant care specialists, after school Nannies. We even have Nannies on call to look after children that are sick and unable to attend school. At Nanny Poppinz of Palm Beach County Florida we specialize in and offer overnight and emergency back up care to Palm Beach families. You can use our services at a moments notice if need be. We are able to dispatch Nannies in just a few moments after receiving your call. Nanny Poppinz takes great pride in meeting the needs of our Nanny Poppinz families who live in Jupiter, Palm Beach Gardens, North Palm Beach, West Palm Beach, Palm Beach Island, Wellington, Lake Worth, Boynton Beach, Delray Beach, Lantana, Manalapan, Gulf Stream, and Boca Raton. Nelly says, "I wouldn't let a family interview a Nanny that We wouldn't place in my own home." NO FEES of any kind unless and until you hire your Nanny. FREE in home consultation direct with the owner. A "Live" Nanny call center available to Palm Beach County 24/7 including evenings, holidays and weekends. All Palm Beach County Nanny referrals have 3 years verifiable Nanny childcare work experience and CPR certification including AED and First Aid training. Each Nanny is legal to work. Emergency Nanny childcare service and 6 month Nanny replacement guarantee for all full & part time Nanny Poppinz Palm Beach County families. This Nanny replacement guarantee is the best in the Nanny industry. Proudly offers Nanny referral fee discounts to Palm Beach County FL military, law enforcement and Federal Government families. 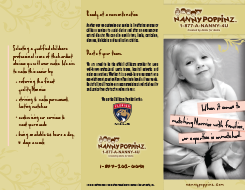 Why use Nanny Poppinz of Palm Beach County Florida? Each Nanny that applies at Nanny Poppinz, must first undergo a personal interview; a full criminal background check and screening for driving history, verification of past employment, legal status verification and their names are cleared from a sexual offender database. Our Palm Beach Nannies must also have at least 3 years plus verifiable Nanny experience. Each Nanny that meets the standards of a Nanny Poppinz Nanny, must then (if not currently complete) become CPR (or be certified within 30 days of hire for permanent referrals) and First Aid Certified before accepting a position with a family. With such extensive screening, we attract a variety of qualified Nannies with diverse backgrounds. When you call us, we listen to your schedule, personality, description of what you and your children might like, language and education requirements and we also help you decide if you will need a Nanny for a full-time, part-time or temporary position. We then send you our carefully selected Nanny candidates to interview with you at a time and date that you choose. Another way we customize our service is by sending Nanny candidates who can work anywhere from one evening up to a full-time live-in and everything in between like an after school Nanny or a PT Nanny for two to three days a week. Whatever the family needs, whether it is short-term like a summer Nanny, or long-term like a permanent PT or FT Nanny, we find Nannies in Palm Beach for our families to interview. Every family has unique childcare needs, and at Nanny Poppinz Palm Beach we aim to be the SOLUTION. Our specialized family service representatives that work personally with you provide you with the top Nannies from which to choose. When you do choose a Nanny, however, our service is still not finished. Should you choose a Nanny that does not work well with your family dynamic, Nanny Poppinz will provide an opportunity for you to interview other Nannies and your replacement will be offered without agency fees if hired within 6 months after the first hire. This guarantee allows an opportunity for you to decide if the Nanny you chose is right for your family, and if not, you can rest assure that Nanny Poppinz will find the right fit..
Our mission, again, is to serve you when you need a Nanny in Palm Beach, Florida. We not only provide our services to prominent resorts in Palm Beach County, such as The Breakers on Palm Beach Island, The Boca Club & Resort in Boca, and the Marriot of Palm Beach Gardens, we also extend our hands to the community. At Nanny Poppinz, WE WILL BE YOUR PALM BEACH COUNTY NANNY CHILDCARE SOLUTION! Please call us at (561) 459-4656 to start the interview process. Prospective Nanny Interviews: Nanny Interviews will be conducted by Dasly. Please call at 954-899-3828 to schedule an interview.